The Storm Prediction Center is keeping an eye on parts of southeastern Illinois, western Kentucky and southern Indiana for the possibility of issuing a Tornado Watch. They expect storms to begin to fire up over the next 2-4 hours. Temperatures are increasing across the region as a deepening area of low pressure is moving through southern Missouri this afternoon. At 2pm CT temperatures are in the lower to middle 70's over southeast Missouri, southern Illinois and western Kentucky. There is also decent amount of wind shear in the atmosphere. When I say wind shear I mean winds are turning with height. For example winds at the surface are out of the southeast. Winds 1,000-2,000 feet up are out of the south. Winds at 15,000 feet are out of the southwest and winds at 30,000 feet are out of the west. If you think about the direction of those winds, you can get a sense of how there is inherent rotation setting up in the atmosphere. There is one thing that is severely lacking for some areas. Moisture. Dew points are low across southern Indiana (30°s and 40°s). There is substantially higher moisture levels at the surface in western Kentucky where the dew points are in the lower to middle 50°s which can easily sustain thunderstorms. As far as Indiana is concerned, I think the "big storms" stay south of a line from Jeffersonville to Princeton. It is interesting to look at a visible satellite image of the area. Look at all the clear skies out there! No wonder temperatures are so warm today. The interesting thing about the above satellite image. Look in western Kentucky. 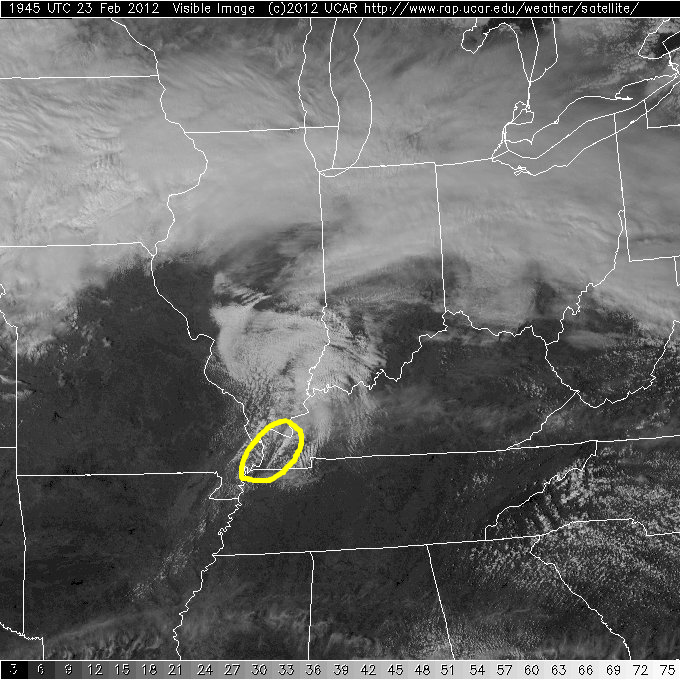 There is a thin little line of clouds that has developed from roughly Reidland, KY to Water Valley, KY. I will be curious to see if we see storm initiation along this line. Once storms fire, they should move quickly to the ENE at around 45mph-50mph. The main threat will likely be damaging winds and large hail but a few tornadoes can not be ruled out. However, I think the threat for tornadoes is relative limited west of Murray, KY to Calvert City, KY.